ne of the requisites for owning nice things is caring for them. Just because something is quality doesn't mean it never needs your attention - in fact, it may require a little bit more maintenance than the items you're used to discarding. Leather needs to be treated, silver needs to be polished, and even the finest knives in the world need to be sharpened and honed. The point is this: quality items that receive proper care should last a lifetime, if not more. Shoes are one of the best examples of this: properly constructed shoes will find the bin if you don't keep them polished (in the case of dress shoes) or otherwise maintained. I have an excellent pair of chukkas (a style of half boot) from the Vintage Shoe Company (highly recommended!) that require some leather treatment every three months or so. 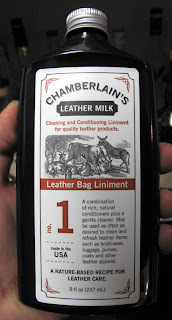 The product I found was actually recommended by another favorite: the Saddleback Leather Company. 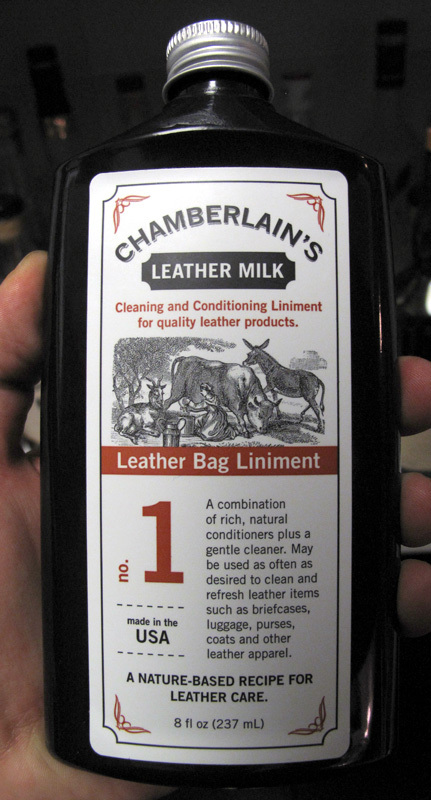 It's called Chamberlain's Leather Milk and they're also based in Texas. Of their five types of treatment products, I chose #1 (called....#1) because it's both a cleanser & conditioner in one. Perhaps #4 is more suitable for my chukkas, but I'm pretty happy with the results thus far. The subject of care, though, was foremost on my mind today when I went to reach for my flashlight in my Barbour jacket, only to discover that it was in a "secret" pocket located between the lining and the exterior. In short, my inside pocket that I use nearly every day had a hole in it. I fished out the flashlight, and sewed it up immediately when I got home. Small tears become large tears if not addressed quickly. Basic sewing skills come in handy for situations like this, or when buttons fall off. If you're a dude, at least learn how to resew buttons and learn a whip stitch. You don't need to know how to make a bespoke suit (although that's not a bad skill to have), just the basics. Silver needs to be polished if it begins looking dull or dark. Don't use Brasso - use polish intended for silver. Brasso will take off way more metal than required for a shine; it's chemically too harsh. If you're talking about dinnerware, only hand wash these items with a sponge and some liquid hand soap. No dishwasher! And be sure to do it shortly after the meal as any salt from the food could make for some pitting. Quality kitchen knives need to be sharpened properly, and honed often. Honing is all about keeping the edge straight, while sharpening removes metal to make the edge narrower (aka: sharper). There's some good videos on how to use a honing steel - just be sure your honing steel is harder than your knives. Steel hardness is measured in Rockwell units. If you're using knives out of the US or Europe, a typical honing steel will probably be fine. Knives made in Japan or anything made from SG10 alloy (you'll know this if you buy this, since it'll be all over the packaging) tend to be considerably harder and may require a ceramic version of the honing steel. When it comes to sharpening the knives, don't bother with electric grinders or V-shaped apparatuses. They'll grind the blade, yes, but it'll leave an edge that will quite soon need to be done again. Grind enough, and you'll be left without a knife. Instead, use a real wet stone, preferably one that uses water instead of oil, and is at least 1000 grit. The higher the grit number, the finer the stone. The finer the stone, the longer the sharpening will take, but the smoother the edge will be. 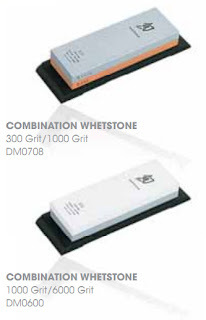 Between the two at left, the 1000/6000 combo is probably the better choice, as 300 grit will be very, very coarse (like remove-a-chip-from-a-blade course). Butcher blocks, if you're lucky enough to have space for one, need to be oiled regularly with mineral oil to keep from drying out. All-Clad pans should be washed gently with soap, then washed again with a sponge and some cleanser to keep shining and polished. The Barbour waxed jackets should be re-proofed yearly. The list goes on. It may seem tiring just reading about all of it, but on a day-to-day basis it's really quite simple. For me, watching a show or a movie while polishing a pair of shoes or some metal odds & ends is quite relaxing. After a few years of good care these items begin to develop character and personality that's you, and they become your favorite things. So take the time to care for your quality purchases, and you'll be richly rewarded. Fail in this endeavor, and you may have been better off with mass-market (disposable) items.